Here's a snippet of tasty information for anyone looking forward to the August release of the Samsung Galaxy Note 10: the South Korean company has just been granted a patent for a stylus with a camera in it. The patent, which was granted by the United States Patent and Trademark Office on February 5, 2019, describes an "electric pen device" with an "optical system including a lens and an image sensor", allowing a camera to be "controlled from the external electronic device." It was first spotted by Patently Mobile and brought to our attention by our buddies at TechRadar. The patent drawings for the next-gen S Pen stylus show the optical lenses in the base of the pen with an image sensor about a quarter of the way down inside the stylus. That's an exciting development for a stylus that looks to be getting smarter with each iteration of the Galaxy range. The Galaxy Note 9 S Pen debuted Bluetooth functionality, which enabled users to to open the camera app and take pictures remotely, start and stop recording video, and start and stop playing audio tracks, so it's clear that Samsung wants to keep innovating with its stylus. 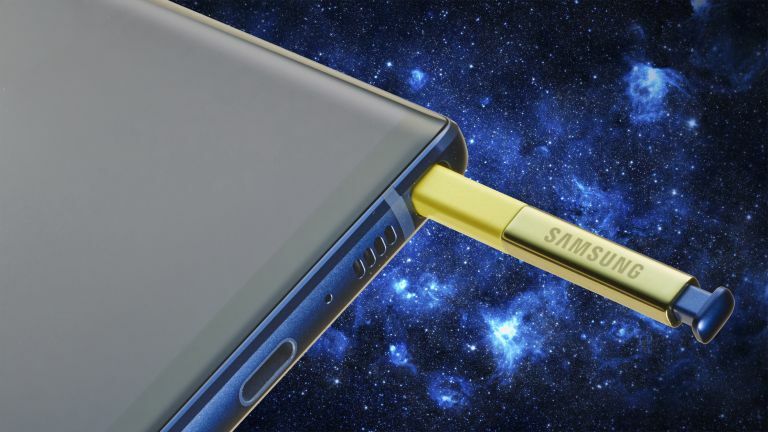 Will we see this innovative new S Pen with the Note 10? Given that the patent application was originally filed two years ago, it's impossible to know. But if it does appear with the Note 10, it could be a compelling upgrade versus the Note 9 and the Samsung Galaxy S10. Samsung will surely hope that it also sees off competition from the Huawei Mate 30 Pro, which could go on sale soon after the Note 10 release date (the Mate 20 Pro release date was 16 October 2018), and the 2019 successor to the iPhone XS Max, which could go on sale in September 2019. Also rumoured for the new Note 10 are a fast new processor, the Exynos 9825, a "perfect screen" with a hidden camera, and 5G connectivity. Should all of these things come with the new handset, Samsung will have a truly compelling Note to mark the product line's tenth anniversary.